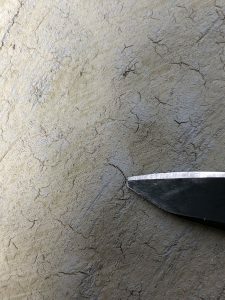 When is a non-optimal coating system optimal? 14 Sep When is a non-optimal coating system optimal? Our firm spends most of its time helping companies determine optimal solutions for corrosion mitigation which is often, but not always, optimal coating/material identification. This summer was no different. One of the largest health insurance providers in the world contacted CCG to assist with evaluation of a concrete cooling tower basin. The facility housed one of their data centers. Security was tight and engineering redundancies were the norm. The consequences of the data center going down for any reason were unfathomable. The cooling system, which runs year-round due to the heat generated by the computer center, has at its heart a cooling tower and associated concrete basin. Our patient was the concrete basin. Recovery trough of three-cell concrete cooling tower basin overcoated with 40-80 mil polyurea. 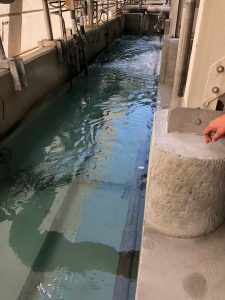 Divided into three discrete cells, the concrete had been coated with a 40-80 mil polyurea, supplied by one of the larger coating manufacturers. The first step in any coating evaluation, or an evaluation of any kind, is a condition survey. Condition surveys can sometimes be a few minutes of looking and poking at a paint system, and sometimes be quantitatively and logistically highly complex. Many companies charge far too much money and spend far too much time in performing condition surveys, and gathering extensive amounts of quantitative data. CCG’s condition surveys are typically “directional” in nature – meaning, that we gather just enough information (and charge our client as little as possible) to make a decision. The decision was simple: can it be overcoated, or not. We didn’t need to charge the client for dozens of quantitative pull tests, hardness tests, etc., to make that determination. In this case, we relied primarily on qualitative data to evaluate the condition of the polymer and concrete substrate. Qualitative adhesion testing with the author trying to pry the coating system apart from itself (cohesive strength) as well as trying to remove coating from concrete substrate (adhesive strength). The coating was well adhered to the concrete substrate. Magnification of coating system showing coating removed from substrate (after scoring). Coating was well adhered and very difficult to remove, and surface cracking (crazing) did not extend fully through the polymeric film. The coating also exhibited excellent cohesive strength (that is, it had not degraded and maintained its inherent strength). 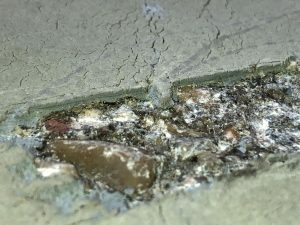 As with most coatings, it exhibited an oxidation layer on the surface (roughly 2-mils thick) which, we also determined, was very well adhered (sometimes oxidation layers are weak and require removal prior to over-coating, such as with epoxy systems exposed to UV). 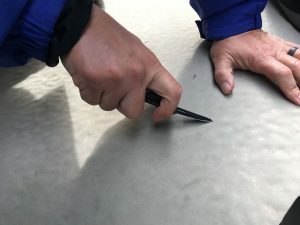 Author used a sharp, multitool knife to scrape multiple areas of the basin to investigate the adhesion of the oxidation layer and approximate its thickness. It was determined that the oxidation layer was well adhered to substrate and would not require removal. The coating also exhibited minor crazing. Tip of multitool pointing to typical surface crazing. There were areas within the basin where overcoated cracks could be seen. 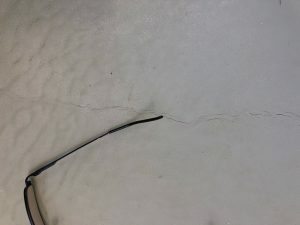 Cracks in the concrete substrate had been repaired prior to overcoating with the existing system. CCG’s final specification called for overcoating all visible cracks using a scrim imbedded in the remedial elastomeric coating system. Overall, the coating system was performing well, degrading very slowly, and was an excellent candidate for overcoating. Prior to our involvement, however, the owner had contacted a couple of coating companies, who said the existing coating needed to be removed. Sadly, this is common. Whenever I hear someone say, “Yeah, you need to remove it and start over.” I get very suspicious, unless there’s data to support that conclusion. More often than not, however, it’s simply the cry of the self-interested (those selling coating or contractors wanting to remove perfectly good coating) or the uninformed. Of course, there are times where complete removal of a coating system is required. But this was not one of them. Now that we had determined that the coating was an excellent candidate for overcoating (saving the client roughly $150,000.00 in coating removal), we now needed to determine which polymer would be optimal for overcoating. We developed a proof of concept. First, we had to figure out, broadly, what coating systems to include in our evaluation. We were only going to evaluate elastomers, as ridged coating systems don’t work over elastomers, which narrowed down our choices substantially. What product do you recommend and what is the anticipated no-maintenance service life. Please provide references. How is the material repaired should it become damaged. What is the anticipated mode of failure at the end of the coatings’ service life. A number of companies did not want to participate due to the perceived risk of overcoating an existing system (see above re: “the uninformed”). Which left us with a handful of polymers. 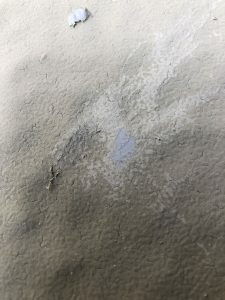 We wrote a proof of concept specification which outlined varying degrees of surface prep, from least aggressive (power-washing and solvent wipe) and least costly, to more aggressive (grinding, sanding) more costly. Our goal was to find the least costly surface prep method while obtaining optimal adhesion. Once the patches were installed, we destroyed them. We pulled them, scrapped them, jumped on them and cut into them to gain an understanding of which had the best cohesive and adhesive qualities. 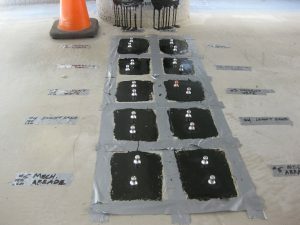 Two coating systems prepared for quantitative pull tests (aluminum dollies) with varying degrees of surface preparation. One coating system stood out the clear winner in every dimension. In our mind, we had hit a home run. Yet, when we presented the report and our conclusion to our client, they were not as enthused. The chief engineer and project manager kept on inquiring about another coating system which performed well, but not nearly as well as our selection. I started to explain that the coating we had selected was stronger, higher cohesive strength, thicker, easier to apply, 100% solids (where the other was less than 70% solid), etc. It would likely last in excess of 20-years with no maintenance. However, our recommendation was black – and the other material was light grey. He explained that they were concerned that the black material would absorb too much sunlight and heat, and compromise the cooling capacity of the system. I persisted, and suggested, perhaps, that they build a sun-screen surrounding the complex. He explained that might impact the airflow surrounding the tower and complex. I was stuck. I was frustrated. I could not wrap my head around their “wrong” decision. The coating they wanted would require more maintenance between 8 and 12 years, be more costly to apply, was not as durable, high in solvent content, etc. But once I had a moment to think things through – I was ashamed at myself. I had lost sight of my job. While I’m a material specialist, my job, fundamentally, is to advocate exclusively in the best interest of the client. And here I was arguing with them because I had assumed that material performance was the primarily variable and it wasn’t. It was cooling. It’s a cooling tower. And I had recommended a black system – which was not optimal for this situation. The truth here was that client valued one characteristic of the coating over the others. And I was not listening. I was so caught up with the values that I attributed to the coating, that I had lost sight of my fundamental role – to do exclusively what’s in the best interest of the client. And in this case, the “non-optimal” coating was, in fact, optimal. I had come close to failing my client. I’m reminded of a story about my oldest daughter. She was 18, a freshman in college. She called and asked my advice (I discouraged her from asking for my permission after she turned 18) about flying to see a friend over a weekend. I said I thought it was a bad idea. Expensive, lots of travel time, with not much time on the ground. And school would be over in a few weeks. I was teaching her how to make her own decisions, and to use my opinion, and others, as sounding boards – but to start to make her own decisions and, consequently, her own mistakes. She said she wanted to take the trip anyway. And my response (one of my better parenting moments) was to say, “Ok. How can I help.” And she was right, and I was wrong. Travel time was much less than I had thought, and she had a blast. In order to be of true service to our clients, and, by extension, family and others, we must be willing to listen carefully and serve in a manner that is in their best interest, not ours.